Potty Training with a little help from Elmo (Part 2) – Do you speak Autism? In my last post I talked about my initial, slightly disastrous attempts to potty train James while on holiday in France, by letting him run around nappy-free to make him more aware of his toileting needs. We also introduced him to a potty training DVD, ‘Elmo’s Potty Time’. In this post, I continue the story. On return to the UK, I was pleased to discover that the weather was glorious, which could only mean one thing- lots of time spent in the garden. With no swimming pool to pollute, I decided to persevere with nappy-free time, as well as attempting to get James to sit on the potty by singing the songs from the Elmo DVD and making a game out of it. Elmo had at least helped James to get over his mistrust of the potty, but getting him to sit on it to actually produce anything was a different story. He couldn’t seem to make the connection. He would sit down for a couple of seconds and look pleased with himself, clearly thinking this was the object of the game. Then he’d get up, run off and pee on the floor. With hindsight, the problem was that nappy-free time had sent him an unclear message. As far as he was concerned he could still ‘go’ as and when he felt the need, the only difference being there was just no nappy to catch it. Expecting James to just make the assumption that he had to hold in his wee and put it somewhere was unrealistic, because James doesn’t ‘do’ assumptions. He is literal; he needs things to be spelt out. Neither is it quite enough to show him a DVD of Elmo ‘using’ the potty, or even sitting on it myself to demonstrate (ok, admit it… you’ve all done it too!) because unlike neuro-typical children, who are social learners, James does not tend to pick up skills by copying others. I needed to find a way of getting him to use the potty because he wanted to, for it to be somehow motivating in itself. Frankly, I was a bit stumped. In the end, it happened by accident. I happened to be standing next to James, potty in hand, when he looked down and I realised he was about to wee. Without really thinking about it, I simply held the potty underneath him to catch it.. and he watched, transfixed, as it filled up. Suddenly, the answer seemed so obvious. Like most children, autistic or not, James gets a sensory kick out of water play- watching running taps, splashing in puddles, dropping stones in water to hear the ‘plop’ and watch the ripples. I had been so focused on getting him to sit down in the prescribed way that it hadn’t even occurred to me that being able to watch himself wee in the potty was the hook that he needed. Five minutes later, I was gobsmacked when he approached the potty, entirely unprompted, and wee’d in it again. And ten minutes after that, again. He even had a good aim, which for any male is impressive. 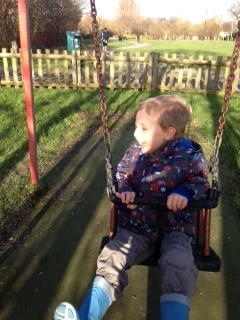 I was thinking triumphantly at this point that we’d cracked it – and on my very first week as a stay-at-home-mum too! It was a fantastic achievement, and it gave me insight that James was more than capable of learning a new skill, provided the motivation was strong enough. But we had a slight problem. Happy as he was to use a potty if we were at home and he was nappy-free, he couldn’t get his head around the idea of pants. He’d wear them- that wasn’t the issue. The trouble was, he didn’t understand that they needed to come off when he needed to go, so he would just wee through them. Looking back, I realise why: it was another assumption I had unfairly expected him to make. Since James had learned to use a potty whilst naked, removing his clothing wasn’t part of the learned sequence and so while it might have been obvious to me, it wasn’t to him. Figuring out how James learns has been, and remains, a steep learning curve. After my initial elation at getting over the first hurdle I started to feel frustrated. We were essentially housebound, as I didn’t have the confidence to take him out anywhere, knowing he would wee through his clothes. Most reluctantly, I started putting him back in nappies whenever we left the house. As autumn approached and the weather started to turn, allowing James to run around nappy-free was becoming less realistic and we didn’t seem to be making any progress with pants. Also, a major issue was that James’ communication difficulties meant he couldn’t tell me he needed to go. Therefore, if he wasn’t in sight of a potty, he’d simply go on the floor. I started to wonder if potty training really was achievable after all; he might have been physically ready, but mentally and emotionally I felt he wasn’t. And then, at the beginning of September, my personal life hit the skids. Readers who know me personally will guess what I am referring to, but suffice to say that certain life events suddenly placed potty training at the bottom of my agenda, to be attempted at a future date when I wasn’t an emotional car-crash. This brings me to March 2014. I had come to the conclusion in my head that until James became more acutely aware of his toileting needs and his communication skills had improved significantly, that there was no point in trying to potty train him. In fact, I think this had become my mantra and my excuse to put the whole thing in the too difficult box. On a more positive note, my life had settled down, and one day I found myself discussing the issue with some of the mums on my parenting course. ‘The thing is,’ one of them commented, ‘Some people potty train their children as early as eighteen months. And lots of children are late talkers but still manage to potty train. You just have to keep taking him to the potty until he gets the idea’. I had been hoping they’d all nod sympathetically when I’d told them James wasn’t ready, but unfortunately they weren’t buying it. That last comment in particular stuck in my head, as I was suddenly reminded of something from years earlier. My husband and I had once decided to get a puppy. Naturally, I wasn’t going to stand for the puppy going to the toilet on the floor, and I could hardly put a nappy on him. Toilet training the puppy was, therefore, simply non-negotiable. Yet, the puppy couldn’t speak, and it certainly wasn’t as intelligent as my son. So, actually, I begrudgingly admitted, if I could toilet train a dog, I could toilet train James. Now, I’m not for one second trying to compare my son to an animal, but the point is that I needed to alter my attitude to the whole process. James was not just going to wake up one day and announce that he was ready. Learning to use a potty was going to require persistence, determination, and a clear, step by step approach. The first thing I did, that very afternoon, was to dig out a pair of pants. We were going to try doing things in logical order. He allowed me to help him into the pants and seemed delighted with his new attire. Time for step two. Previously, I had moved the potty around, bringing it to wherever James happened to be at the time so that he’d use the potty and not the floor. This time, we were going to establish a location for it to stay, so that he had to go to it, rather than the other way around. This would require more conscious thought on his part, and also get him used to controlling his bladder, something he’d never needed to do before, but that I suspected he was fully capable of. 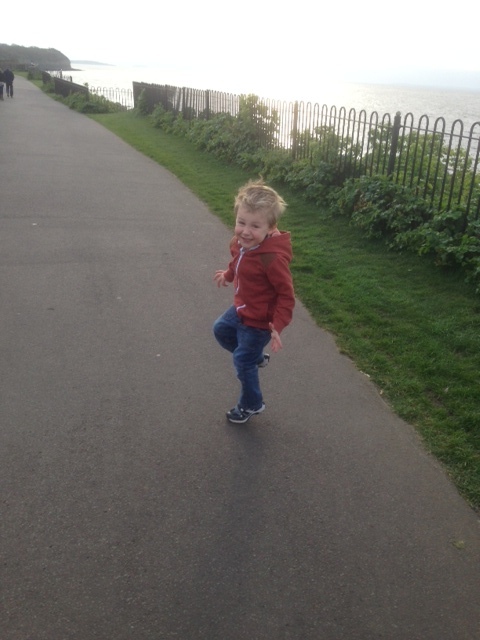 ‘First.. and Then..’ is a very effective simple-language approach that we have been taught by James’ speech and language therapist to help him understand the order of events, and limit his anxiety . Over time I’ve learned that when speaking giving James an instruction or asking him a question, the fewer words used, the better; eliminating as much ‘meaningless’ language as possible. I proceeded to help him out of the pants, and obligingly, he went in the potty and I helped him back into the them again. We then went to the toilet, poured in the contents of the potty and I let him watch, fascinated, as I flushed it away. Cue momentous amounts of praise, cuddles, and dancing around, shouting ‘hooray for underpants’ ! The delight in his face was plain to see – whatever he had done, mummy was clearly pleased with him for doing it, and he was basking in the attention. After ten minutes or so, we repeated the exercise. This time, he was only able to produce a few drops, but that was fine. Just as with the puppy, it was the routine that was crucial. If we simply repeated the process enough times, and I reinforced it with enough praise, I figured James would eventually become reliant on the routine- and I was right. Before long, he wasn’t waiting for me to remind him what to do. The drill had become entrenched in his mind, and as a result, accidents were actually pretty few and far between. At long last, we really had cracked it. ‘Number twos’ have admittedly been a little more awkward, mainly as James still point blank refuses to sit down. But after some initial hesitation, and a couple of little accidents, he has decided on a way that works for him. And hey.. since in large parts of the world squatting is the norm, who am I to call his method unconventional? James still wears a nappy to bed, but this doesn’t worry me in the slightest, as plenty of children his age are not yet dry over night. It will come with time, I’m sure. Learning to use a potty might be a small achievement in the grand scheme of things. After all, most people manage it eventually. However, the experience has been a real eye-opener for me, as I now realise that James’ understanding and abilities are far greater than I previously gave him credit for. They might be heavily masked by his delayed social, communication and emotional skills, but that does not mean they are not there. Autism does not define James; it is simply a part of who he is, and underneath it I have the strongest feeling there is huge potential. It is just a question of tapping into it, and that gives me great hopes for his future. This entry was posted in Autism, Disability, Parenting, Potty Training, Uncategorized and tagged #parenting #autism #autisticspectrumdisorder #disability, #pottytraining. Bookmark the permalink. What a fantastic parent you are! I have found your blog really heartening although my own daughter is much older than your son. I am over the moon to find a comment from your mum on the talk about autism forum telling us that you have got a place for James at a great school. Well done for fighting so intelligently and articulately for your son. Apologies if this comment is in the wrong place – in a hurry and couldn’t seem to find the right link. Hope you get this.